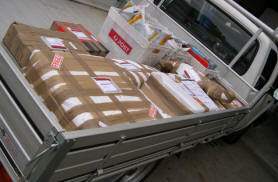 Great care is taken to protect your goods here at minisport, we use state of the art products and utilize any protective items we possibly can to ensure your mini goods arrive they way they leave here. 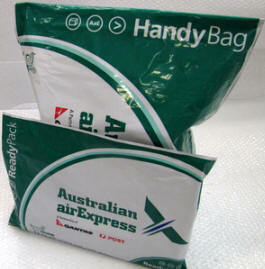 We use Australian Air express and we have a Flat shipping/handling fee of $14.95 on products purchased on this webpage no matter how many you buy (large body panels and VERY Big orders over a very long distance etc may attract extra courier charges, we will try to keep to a minimum). We will try (where size and weight are applicable) to send your goods the fastest way possible- if you do live remote we can (for a small fee of about $5) give you a TNT overnight first class service with TNT. 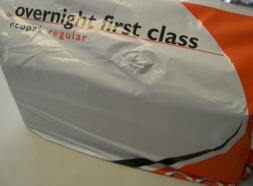 On completion of checkout, freight across Australia will be automatically inserted at $14.95, if any more is required (i.e. 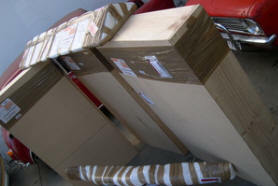 a large parcel/long distance or multiple bags) we will contact you as soon as we can. Please note that any parcel sent to a PO BOX is subject to extra freight charges due to the excessive cost of the Australia Post service. We sell quite a lot of goods overseas, we will contact you with postage charges before your order is processed completely, most goods will be sent via Australia post/EMS or TNT, If you do have an account with any major international shipper (i.e. FED EX) we are more than happy to work with you. You make like to check your import duty & local customs fees in your own country- we are not liable for any charges that are applicable in your country, and we CANNOT quote on these. When we ship body panels, we normally will charge you a packing fee, this fee is for us to make a wooden box to place your panels in, this will best protect and ensure your panels arrive in tip top condition. The normal charge for this is around $40-$50, and this includes all wood materials and labour to make the box, you can see in the images an example of the wooden boxes we make. We also normally ask that insurance is taken out on any panels.